Home » AmigaOne Emulation Madness !!! One of my very favorite things about the Amiga from the very first day I got my Amiga 1000 back in 1986 was the fact that it could emulate other computer systems. The Commodore Sidecar was a hardware box that attached to the Amiga to provide hardware level MS-DOS compatibility (remember, Windows 95 would not be available for another 9 years!). 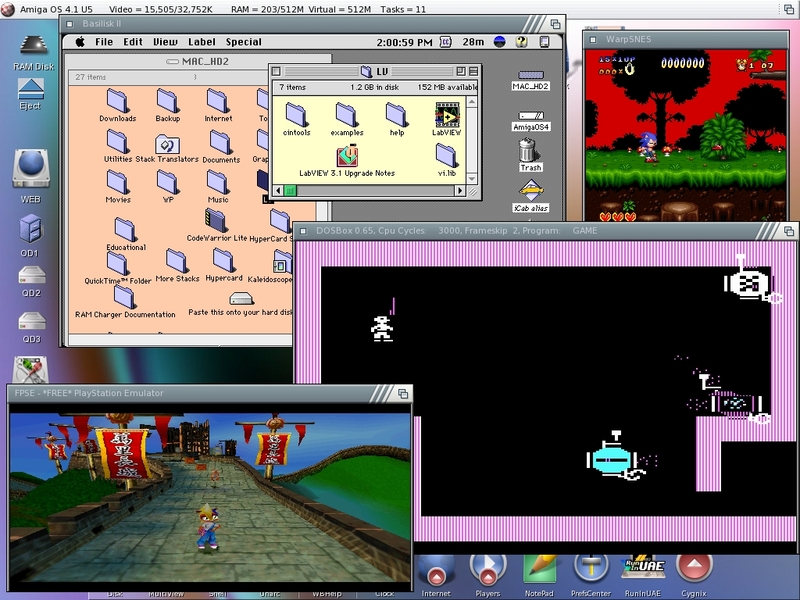 But even better, there were software only emulators that could do an incredible job of completely emulating an entirely different computer system, even if it had a different CPU (processor). We soon saw C64 emulators, Coco emulators, Apple II emulators, PC emulators, and MacIntosh emulators for the Amiga. One fantastic thing about the MacIntosh emulator for the Amiga when it first appeared was the incredible fact that - because the MAC used the same CPU as the Amiga, namely the Morotola 68000 series processors, AND the Amiga also had additional co processors to offload graphics, audio, disk drive, and other tasks, the Amiga MAC emulator actually ran FASTER than an equivalent MacIntosh! I remember using some of those Mac Emulators, and they were impressive. So what about emulation for the AmigaOne with OS4.1? Well, there are even more emulators for the AmigaOne than there were for the Amiga 1000. Here is a picture of my Micro AmigaOne running 4 emulators simultaneously! Yes, that's right! Each in is very own window on Workbench. Here we have the Basilisk2 MacIntosh Emulator. It is actually a 68k MAC emulator that is running MAC OS 7.5.5. It can be found on OS4 Depot . Oh yes, you may notice that I uploaded this program ... I found a few minor issues in the source and fixed them and uploaded some new code that made it possible to use the MAC Internet Explorer, iCab and Netscape Navigator on the MAC emulator on the AmigaOne. Next, we see WarpSNES - a super Nintendo emulator that can be obtained HERE. It runs very well and allows many SNES games to be played - it even snapshots the current state and saves it when you quit for every game so you can restart where you left off. Then we have DOSBox. DOSBox is a PC DOS emulator that allows you to run many old PC games that work in DOS mode. It can be obtained HERE. DOSBox is a lot of fun. Can anyone identify the educational game that I am running in DOSBox in this picture? I'll give you a hint - I wrote part of the Radio Shack Color Computer version of this game back in 1984. Finally we have my favorite newest emulator - FPSE from Amidog. This emulator runs Sony Playstation games incredibly well. You can get it at AmiDog's Web Site. Many playstation ROMs are available for it - and it will use actual CD games as well, but from what I hear, rather slowly. Better to use .bin and .ISO files. One trick with this emulator - you will need to obtain a SCPH1001 ROM file for use with it to allow the loading and saving of games in progress to the simulated memory cards. Amidog has a whole database of games and programs that work with this emulator. Emulation on an AmigaOne is really exciting. Interestingly, sevral 68k emulators also work on the AmigaOne - being emulated on the fly (JIT) with the AmigaOne's built in emulation software - Petunia. Such emulators as the Coco (Dragon) emulator, AppleII, AtariST, Atari 800, PC-Task and many more old 68k emulators work properly on AmigaOS4.1 with an AmigaOne. I hope you have fun emulating!